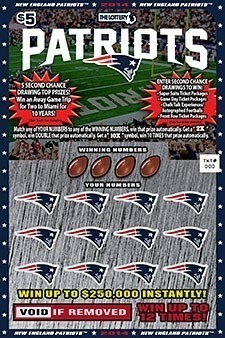 If you wish to make any use of material on the Website other than that set out in this section, please address your request to: patriotsmasslottery@patriots.com. The Company name, the term NEW ENGLAND PATRIOTS, the Company logo and all related names, logos, product and service names, designs and slogans are trademarks and/or service marks of the Company or its affiliates or licensors. You must not use such marks without the prior written permission of the Company. All other names, logos, product and service names, designs and slogans on this Website are the trademarks of their respective owners. This website is operated by New England Patriots LLC. All other feedback, comments, requests for technical support and other communications relating to the Website should be directed to: patriotsmasslottery@patriots.com.